Julius Schwartz was born in New York City on June 19, 1915. As a boy he was a big fan of science fiction which was the burgeoning literary genre of the day. In 1932, he and Mort Weisinger (who would also work at DC) published "The Time Traveler", a sci-fi fanzine. The two later formed the Solar Sales Service, as agents for such popular sci-fi authors as H.P.Lovecraft, Ray Bradbury and Robert Bloch. He went to work for DC in 1944 after an introduction by Alfred Bester, editing All Star Comics, Green Lantern, Flash and Sensation Comics. Because of his connection science fiction (and the fact that many sci-fi authors who were friends of Schwartz were working at DC), when DC began Strange Adventures and Mystery in Space he was the natural candidate for editor. More and more work led him to editing a new title for DC, Showcase Comics, which premiered on the stands in January 1956. But the title's sales figures were dismal at best and it was on the verge of existential extinction by the third issue when Schwartz decide to take a chance on something new, which was in reality just a rehashing of something old, and on the cover of the title's fourth issue was this something. He was called "the Flash"! Sporting a red leotard outfit with a head mask and a yellow lightning bolt on his chest, the Flash made his debut on the stands with the Sept-Oct 1956 issue, written by Robert Kannigher and illustrated by the great Carmine Infantino. His origin story was a hit! Sales figures on the title jumped, but the editor wasn't going to get the figures before scheduling two more issues. Showcase #5 had the stories that were presumably really scheduled for issue four, issue six however, was the introduction of another super type hero with the "Challengers of the Unknown". Not really super, these heroes were just four guys who survived a plane crash who were just the best in their respective fields. A scientist, a pilot, a wrestler and a circus performer. But their adventures were entirely science fiction, illustrated by the great Jack Kirby. They again appeared in issue seven, but by this time Schwartz had seen the sales figures for issue 4, and the Flash made his second appearance in Showcase #8, and thanks to Julius Schwartz's inventiveness and foresight, the "second age of super heroes" was born. Showcase would continue to introduce new heroes from Adam Strange to Space Ranger and eventually Green Lantern, another "revived" hero from DC's past in issue 22. 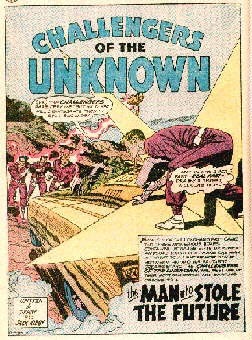 Challengers of the Unknown would be the first to get their own title, with the publication of the first issue in April 1958. The Flash would get his own title, continuing the numbering from the defunct series, in 1959. Green Lantern got his own title in 1960. But what really solidified the return of the superhero appeared in another title now edited by Julie Schwartz. Brave & the Bold #28, cover dated 2-3/60, took another leap backward to achieve something new again. By teaming up the leading super characters of the DC universe and like they had in 1941 with All Star Comics, they had truly signaled that the superhero was here to stay. illo: From Challengers of the Unknown , illustrated by Jack Kirby & inked by Wally Wood. The Justice League of America was formed by the Flash, Green Lantern, Wonder Woman, Martian Manhunter and Aquaman made up the core of this team, joined by even Batman and Superman at some point. their popularity was so great that DC gave the group their own title a scant six months after they first appeared in Brave & Bold #28. The superhero in comics had cemented his presence, and a new age was coming. They called it... THE MARVEL AGE OF COMICS, and it would change comics forever.. This is the th page view on this website since 1994. Thanks for stopping by! !